One of the most elusive scientific challenges for over 150 years has been to explain why cooperation survives despite being a seemingly inferior strategy from an evolutionary point of view. Over the years, various theoretical scenarios aimed at solving the evolutionary puzzle of cooperation have been proposed, eventually identifying several cooperation-promoting mechanisms: kin selection, direct reciprocity, indirect reciprocity, network reciprocity, and group selection. 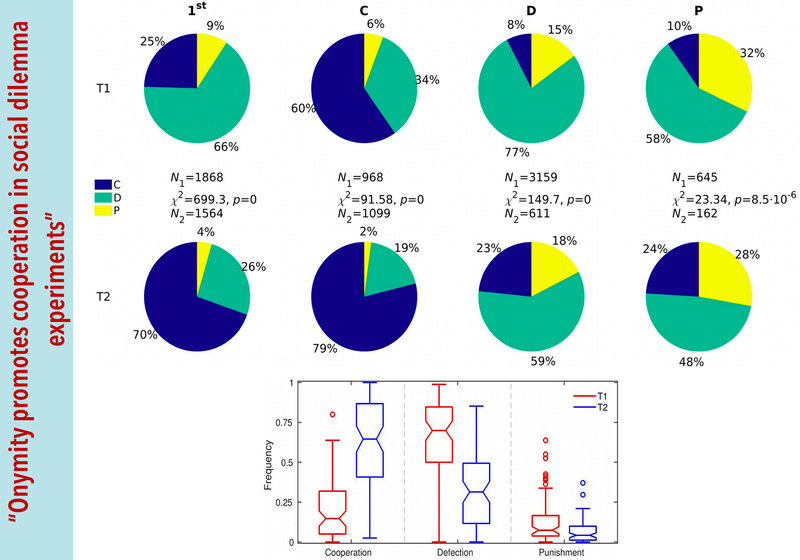 We report the results of repeated Prisoner’s Dilemma experiments with anonymous and onymous pairwise interactions among individuals. We find that onymity significantly increases the frequency of cooperation and the median payoff per round relative to anonymity. Furthermore, we also show that the correlation between players’ ranks and the usage of strategies (cooperation, defection, or punishment) underwent a fundamental shift, whereby more prosocial actions are rewarded with a better ranking under onymity. Our findings prove that reducing anonymity is a valid promoter of cooperation, leading to higher payoffs for cooperators and thus suppressing an incentive—anonymity—that would ultimately favor defection. 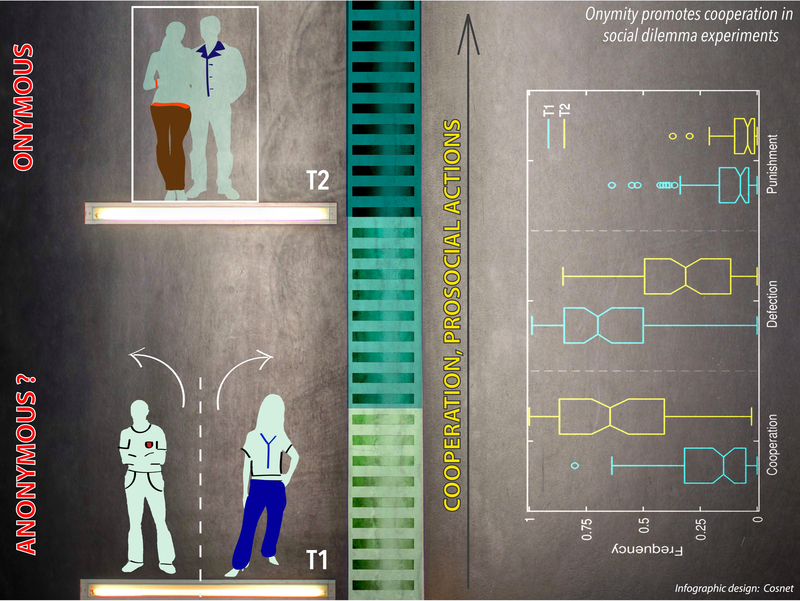 SOURCE: Z. Wang, M. Jusup, R.-W. Wang, L. Shi, Y. Iwasa, Y. Moreno and J. Kurths, “Onymity promotes cooperation in social dilemma experiments”, Science Advances 3:e1601444 (2017).Supplementary Material . 2.- A. Aleta, S. Meloni, M. Perc, and Y. Moreno, “From degree-correlated to payoff-correlated activity for an optimal resolution of social dilemmas”, Physical Review E 94, 062315 (2016). An active participation of players in evolutionary games depends on several factors, ranging from personal stakes to the properties of the interaction network. Diverse activity patterns thus have to be taken into account when studying the evolution of cooperation in social dilemmas. Here we study the weak prisoner’s dilemma game, where the activity of each player is determined in a probabilistic manner either by its degree or by its payoff. 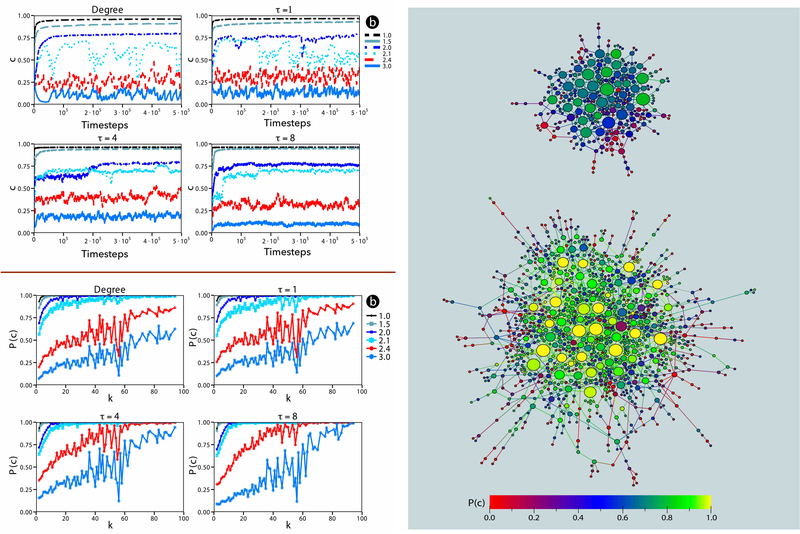 While degree-correlated activity introduces cascading failures of cooperation that are particularly severe on scale-free networks with frequently inactive hubs, payoff-correlated activity provides a more nuanced activity profile, which ultimately hinders systemic breakdowns of cooperation. To determine optimal conditions for the evolution of cooperation, we introduce an exponential decay to payoff-correlated activity that determines how fast the activity of a player returns to its default state. We show that there exists an intermediate decay rate at which the resolution of the social dilemma is optimal. This can be explained by the emerging activity patterns of players, where the inactivity of hubs is compensated effectively by the increased activity of average-degree players, who through their collective influence in the network sustain a higher level of cooperation. The sudden drops in the fraction of cooperators observed with degree-correlated activity therefore vanish, and so does the need for the lengthy spatiotemporal reorganization of compact cooperative clusters. The absence of such asymmetric dynamic instabilities thus leads to an optimal resolution of social dilemmas, especially when the conditions for the evolution of cooperation are strongly adverse.